In case you missed it over the last few days: Ukraine has descended into total chaos and Venezuela is following close behind. In Ukraine, the turmoil has mostly taken place in Kiev. The protests were inspired by President Viktor Yanukovych’s set of anti-protest laws. The situation has only worsened as the government has used force to crack down on the large gatherings. 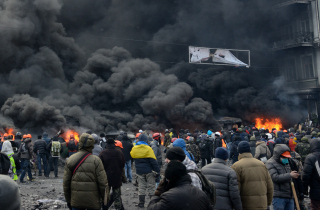 The latest reports place the Kiev death toll at 38. According to VICE‘s UK editor, Henry Langston, local hotels are being used as morgues as the bloodshed worsens. I am currently outside Hotel Ukraine on Instytutska Street [next to Independence Square] and there is a sniper firing pot shots. [Sound of a gunshot] Yup, that was another one. There are some barricades near the hotel and there are only a couple of protesters on them—I think they’re basically pinned down. The hotel itself is basically like a makeshift triage center and a morgue right now. Medics here have counted 15 dead, who they think have been shot by snipers. In the lobby of the hotel you’ve got the wounded being assessed and rushed to hospital and a row of dead bodies lined up, covered in shrouds. When the wounded started coming into the hospital, the doctors who happened to be staying there couldn’t treat them, had no equipment to deal with serious bleeding. We saw about 20 captured policemen being brought into one of the protester’s tents—this is towards the City Hall and there are a bunch of tents where the protesters sleep. They all looked very young. They were in their very early 20s and some of them were wounded. They were surrounded by protesters who were spitting on them, trying to punch them, but there were other protesters trying to stop that. And there were priests there trying to keep the peace. Watch live streaming coverage of the protests here.